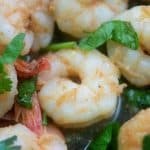 Cilantro Lime Shrimp are bursting with bright citrus flavor and a little kick of cayenne. Heat the oil in a large heavy bottomed skillet over medium heat. Add the shrimp and sprinkle with the salt, cumin, and cayenne. Cook, stirring often, for 4-5 minutes or until shrimp is pink and opaque. Add the garlic to the skillet and cook for 1 minute more. Remove from heat and add the lime juice and cilantro. Stir well to combine. Add additional cayenne pepper for more or a spicy kick.